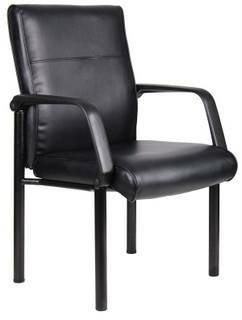 Beautifully upholstered in black LeatherPlus. LeatherPlus is leather that is polyurethane infused for added softness and durability. Passive ergonomic seating with built-in lumbar support. Seat Size: 19.5″W X 21″D. Overall size:26″W X 25.5″D X 35.5″H.